He may be a macho action star, but the proud papa took his little leading ladies Seraphina and Violet (not pictured) to an all-out girly day at fashion camp! 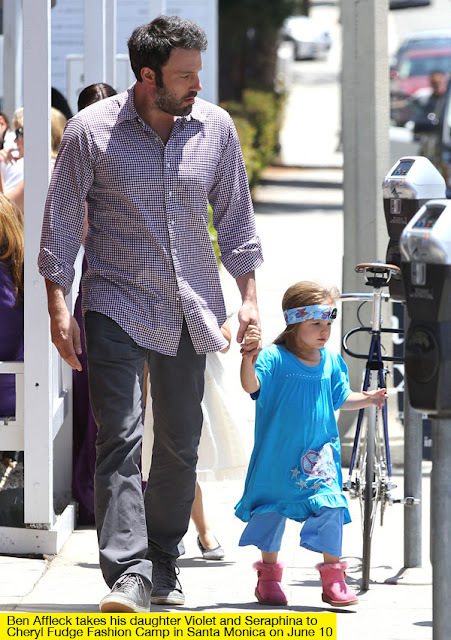 There are tons of reasons to love Ben Affleck but it’s easy to fall even harder as he holds his daughter Seraphina‘s hand as they stroll to Cheryl Fudge Fashion Camp in Santa Monica. While Ben’s wife Jennifer Garner, 39, was looking after newborn Samuel, Ben, 39, took over his daddy duties with his little girls Violet, 6, and Seraphina, 3, when they were out on June 10. Ben looked casual in his plaid button-up and sneakers and Violet was all styled up in her blue boho look with fuzzy pink boots! Doesn’t Ben make such a handsome daddy, HollyMoms?